Our forest monitoring project, Forest Watch, was started in 2017 when the Forest Watch committee piloted some educational activities in a local school (Middle River Elementary). A small woodlot adjoining the school provided the perfect location to discuss forest ecology and get the students into the woods. In early June, 2017, we identified trees, shrubs, and animals found in and around the woodlot. The main focus was to give elementary students an insight into inventorying a forest stand. We introduced the concept that a tree, like any living thing, has a lifespan. We looked for living creatures on both live and dead trees to help teach them that these living and dead trees are all part of animal habitat. 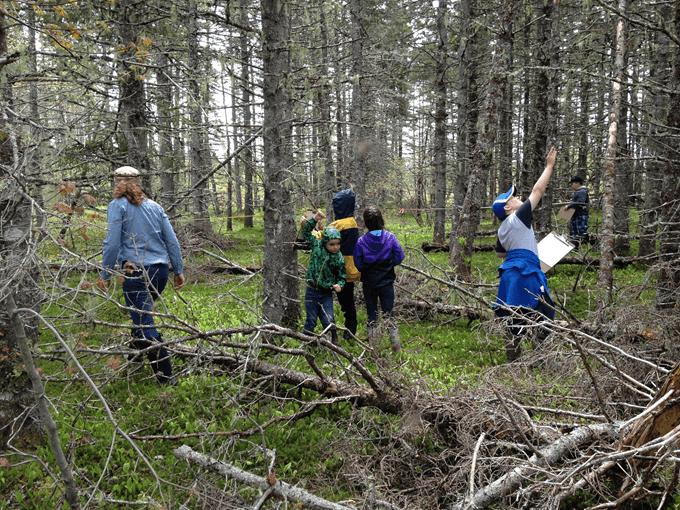 Also in June, 2017, the Forest Watch volunteers established a connection with the Mersey Tobeatic Research Institute, located in the other Nova Scotian UNESCO Biosphere Reserve (Southwest Nova). Their experienced staff trained the Bras d’Or Biosphere volunteers in methods to be used for forest monitoring in our Biosphere. In September 2017, we returned to Middle River Elementary to review forest species and look for living things found within the woodlot in the fall season. We also began a program with the high school at Potlotek First Nation. The first site visit with those students happened during the following spring. These schools will be revisited and the program expanded to other schools in the Biosphere. We will help students train their eyes, ears and other senses on the forest…to develop the tools to understand what Mother Earth is telling us. Our forest committee is expanding its’ horizons to post-secondary International students. In early November 2017, the Forestry Committee of the Bras d’Or Lake Biosphere Reserve Association played host to 35 International Students from the Coady Institute of St. Francis Xavier University. Students were given a tour of a private woodlot in Johnstown highlighting restoration work that is being done there. The students enjoyed learning about old growth forests but were equally as curious about the operations within the context of a UNESCO Biosphere.